Quick overview Now in its 16th edition, this book reflects all research developments, theories and ideas, whilst also retaining all of the qualities which have established it as a leading undergraduate psychology textbook over the years, including its highly accessible and engaging student-centred approach. 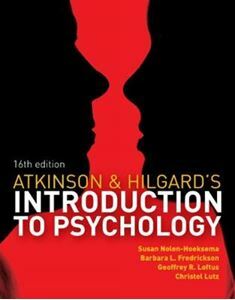 Now in its sixteenth edition, Atkinson & Hilgard's Introduction to Psychology has been fully revised and updated to reflect all recent research developments, theories and ideas, whilst also retaining all of the qualities which have established it as a leading undergraduate psychology textbook over the past five decades, including its highly accessible and engaging student-centred approach. The established author team of Susan Nolen-Hoeksema, Barbara Fredrickson and Geoffrey R. Loftus has been joined by Christel Lutz (University College Utrecht), who has helped to add a fresh European influence, and thereby create a truly international introductory textbook. The 'Cutting Edge Research' box features and 'Seeing Both Sides' essays which conclude each chapter have been fully updated and replaced throughout, using contributions from a range of experts across the globe, and really help to bring the text to life for students.